Anyone who had use cloud storage or online file backup knows that it’s a headache and painful experience when it comes to backup file which are large in size. Well, it’s now an entirely difference experience with Dropbox. 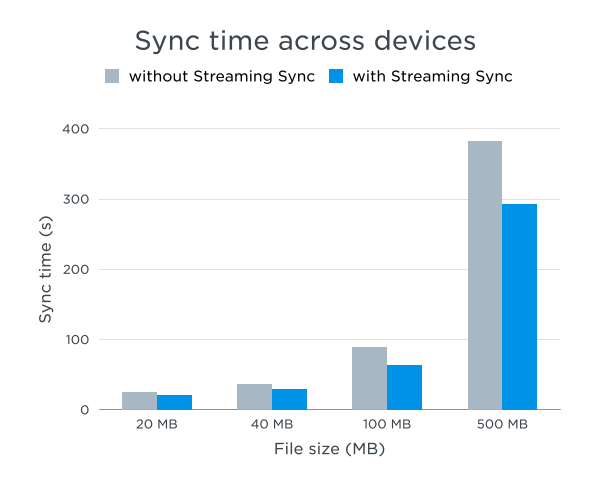 Dropbox introduce their new feature called Streaming Sync. While it’s not much differences noticed when dealing with files of 20MB and below, but for anything above that, Dropbox claim that this feature can help boost up the transfer rate up to 2X faster! This is quite impressive especially for those who had experience these awful backup rate for larger file. So, the next time if you’re planning to sync or transfer large file using Dropbox. Make sure if you notice any difference. Dropbox promise you will get an extra speed boost for these. The better part, it’s free upgrade for all. No additional cost or upgrade is needed to enjoy this great streaming sync. For me, the greatest part of this feature is I can store my entire photo online with ease. Especially when dealing with RAW format type of photos that eat spaces like a monster. The great feature had been welcome by most of the users. Along with this upgrade, additional four language support will be added as well to the app alone. There will be new ability to view your latest notification thru your account. They had been injecting new features and experience for their users. Keep up the good work Dropbox!